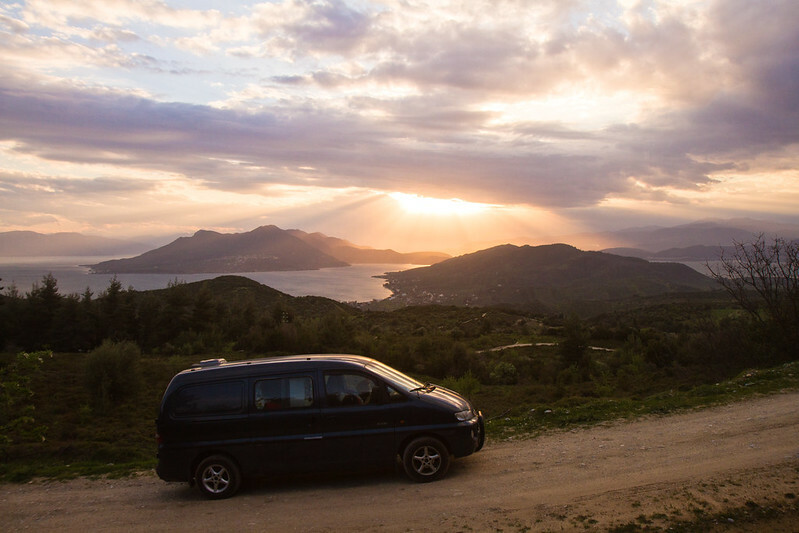 How to Thrive, Living the Vanlife! | How to Thrive, Living the Vanlife! Home photography How to Thrive, Living the Vanlife! 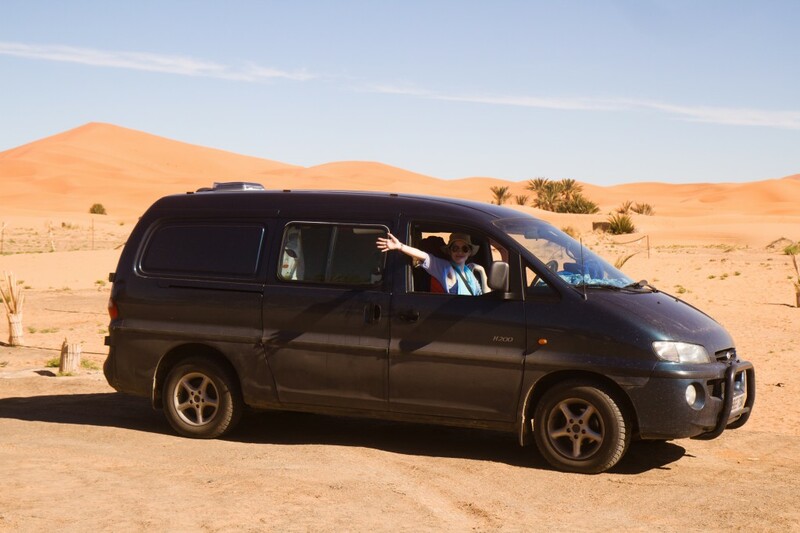 Whilst completely enthralled by the idea of travelling and living in a van together, it was important to Mike and I that we didn’t feel like we were living in some metal box, with a mattress haphazardly thrown in the back. 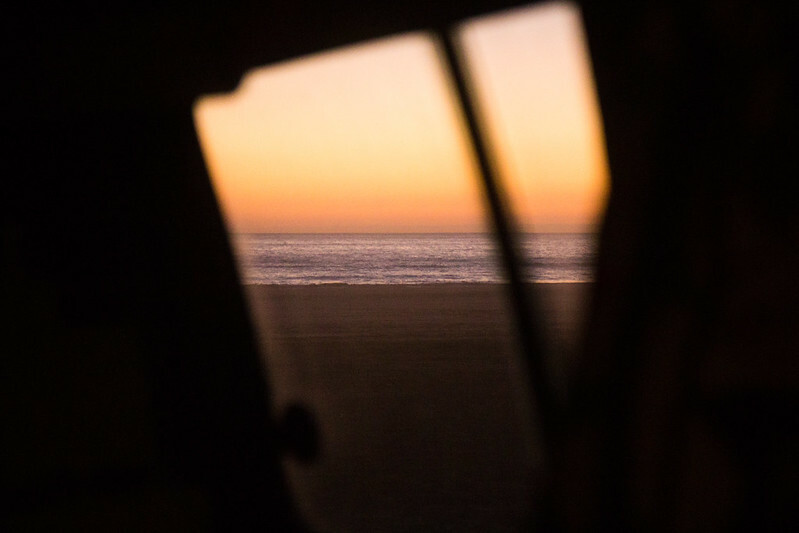 If our van was to be our home for the foreseeable future, we wanted to ensure that we were comfortable, warm, and not just that, we wanted to thrive, living the vanlife. 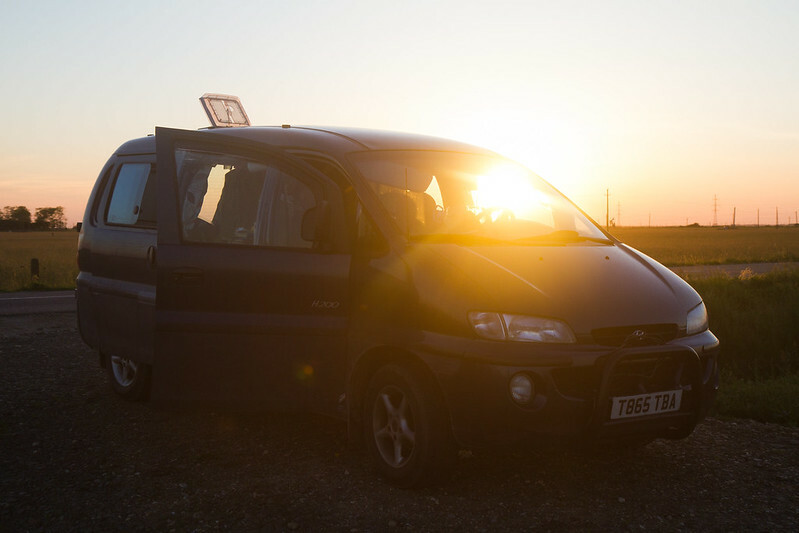 We wanted our van to be a restorative and calm environment, somewhere that we’d look forward to returning to at the end of a long day – we didn’t want to feel like we were missing out on anything, we really believed that it would be entirely possible to fit all of the necessities, and a few of the little luxuries, of static living, inside our tiny van home. 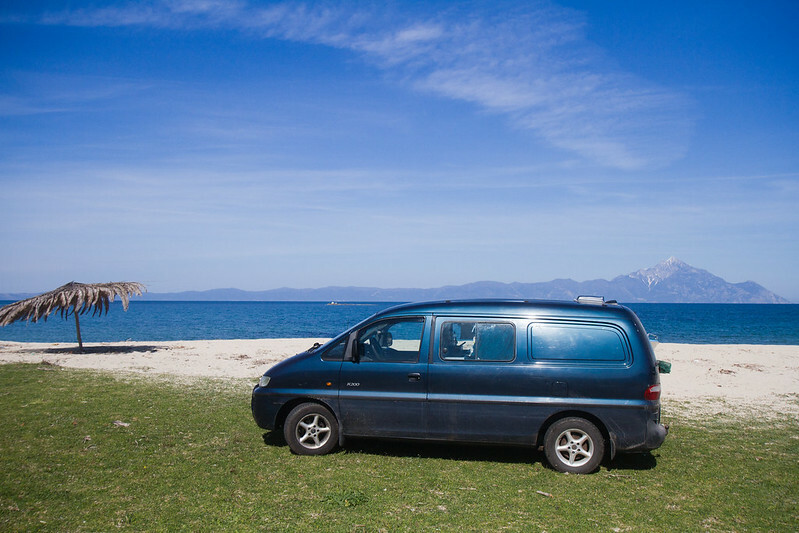 Here a few ideas and tips, as to how we keep comfortable living inside our self-converted campervan. Living in a van when it’s cold can get pretty brutal, if you’re not properly prepared. Mike and I spent a considerable amount of effort and time insulating our self-converted campervan, making sure that we’d stay warm during even the harshest of winter nights. We tested our van on the west coast of Scotland, during some raging December gales, and have spent nights stuck up in the mountains waiting for snow-covered roads to be ploughed, the thermometer sometimes reaching -6 to -10 degrees celcius. We recently spent a few weeks in Norway, and after experiencing the easy temperatures of Greece, Romania, and continental Europe, in the early springtime, we were, once again, a little unexpectedly, thrust back into snowy conditions, Norway having experienced one of their hardest winters in recent memory. 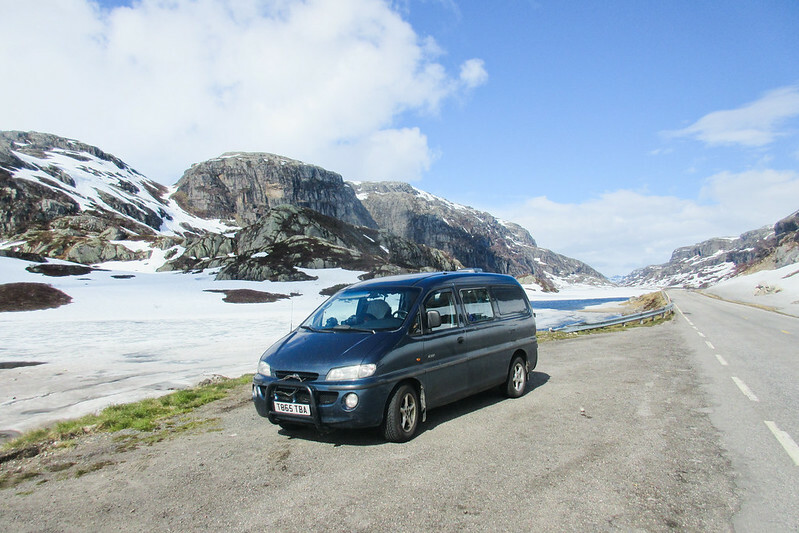 – Insulate your van! We spent a week or so insulating our van with thermawrap, and recycled plastic bottle material. This proved to make such a difference, instead of feeling like you are living inside a freezing metal box, with insulated and carpeted walls you are protected from the outside environment. 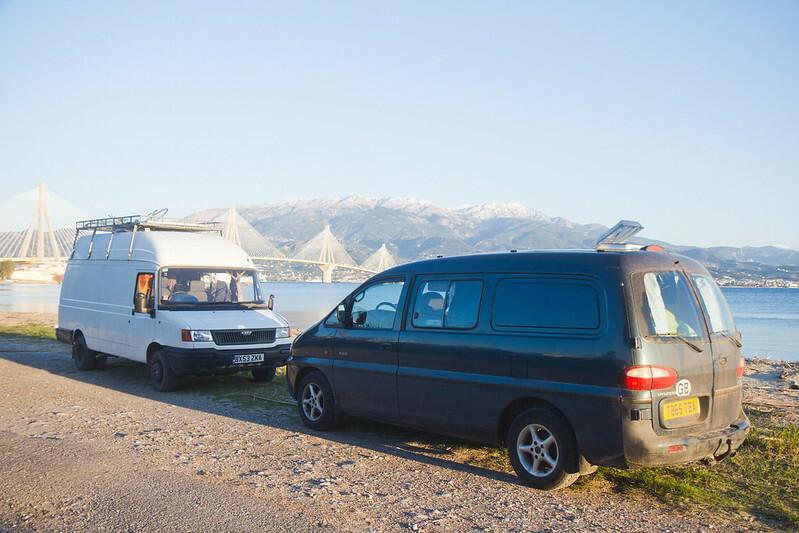 Completely cover any metal on the inside of your van, as this will reduce the chance of condensation being a problem on chilly nights. Hang up thick, black-out, curtains to stop heat escaping from the glass windows. To minimise condensation issues further, install a vent and rain-guards on your front windows. Also, make sure to seal up any cracks you might have in your vehicle’s bodywork. – It’s obvious, but make sure you’re the owner of a hot water bottle, some smartwool socks, a good hat, and some heavy blankets. – Eat stews and enough protein. Throw a load of vegetables into a pan, with some grains or beans, add some stock and your choice of herbs. Our favourite is the ever reliable sweet potato and pearl barley stew, with Turmeric and a mountain of garlic and onions. Drink lots of tea! – Blast your heating before you go to bed, for a few minutes. If you have insulated well, the heat should remain inside the van for some time. – For some, prevention might prove better than cure. If your circumstances allow it, drive south! If you are in the states, drive to the desert. If you are in Europe, drive as far south as you possibly can, either to the south coast of Spain, or to Portugal, or Greece. 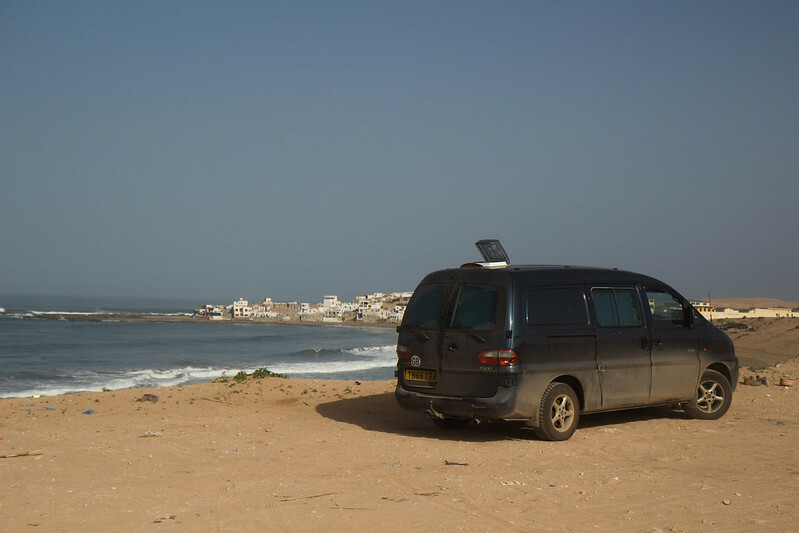 If you’re really desperate for some mild temperatures, though, do what countless other vandwellers and experienced RVers do – catch a ferry to Morocco! Morocco is a dream come true for those wishing to escape the winter. The temperatures are mild, the sun shines near enough constantly, the food and the diesel are ultra affordable, and the culture is unique. We spent the last winter in Morocco, and had a truly amazing time. One thing to keep in mind, though, is that if you’re visiting in the winter, do try to avoid the mountain roads. It’s not going to be warm in the mountains, of course, and though Mike and I were trying to escape the cold, we ended up getting stranded in some number of tiny mountain villages, waiting for closed roads to be ploughed. 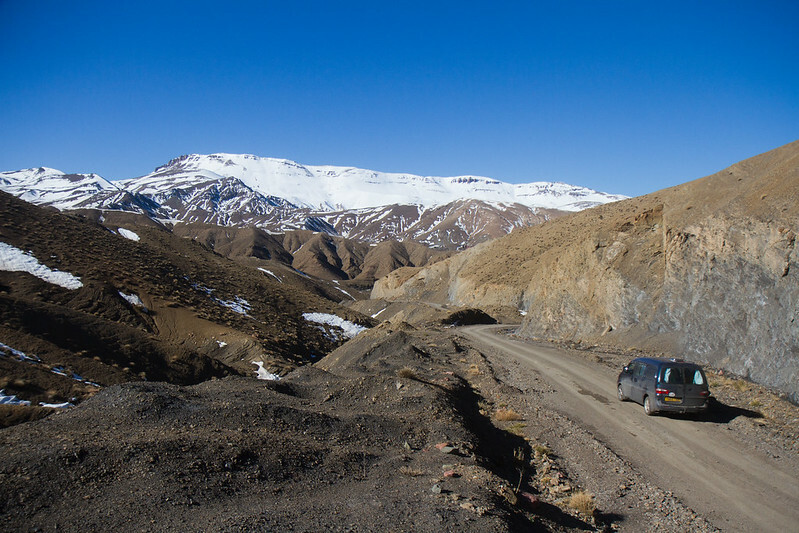 The driving conditions on these roads, whilst adventurous, and breath-takingly pretty, were a little dicey, too. – Down dirt roads, in the middle of forests. – In large cities right next to famous attractions. – On the top of snowy mountains. – In noisy motorway service areas and gas station carparks. To name but a few. Mike and I will never camp anywhere unless the both of us feel good about the spot we’re scoping out. Our requirements have, for the most part, been that the spot isn’t on a really busy, noisy, road, if we can help it, that there aren’t too many people around, and that we’re not overlooked, particularly. We have only been woken up by the police once, on our trip. We were parked outside a watermelon farm in central Spain. Anyway, we’ve saved thousands of euros stealth camping, and have woken up to some of the most unbelievable views, views we couldn’t afford from a hotel window. For the vast majority of our food, we’ve cooked inside the van. We’ve found that it’s been really important to eat wholesome, sustaining and nutritious meals whilst on the road – helping your body and your mind adjust to ever-changing environments. Our food choices have kept us happy and healthy. We make sure to always have a selection of fruits and vegetables with us, and our store-cupboard is full of pastas, couscous, chickpeas etc. It’s a lot of fun to shop at local supermarkets and play around with various ingredients that you’re un-used to. For example, in Greece, we would stumble upon countless little stores, on every other street, that would have shelves stacked with amazing deep green salad vegetables, a variety of herbs, and walnuts. In Norway, unlike nearly everything else, Blueberries were incredibly affordable. Do take into consideration where you are, though. You want to avoid food poisoning at all costs, getting sick on the road is a hugely un-enjoyable and slightly scary experience! Take it from me, I know! Exercise will be hugely beneficial whilst living and travelling in a van. Go hiking, or if you can, get bicycles. Just try really hard to exercise a little, every day. We’ve found it a challenge to balance up getting the right amount of exercise with how many hours we spend on the road, but when we do exercise, we feel rejuvenated, noticeably more alert, and generally in a better state of being. 4. Cleanliness and other Basic Comforts. Dry shampoo, natural deodorants, baby wipes, these are the basic components of keeping clean on the road. And, if you are a girl, you’re going to have to get used to using a pee-funnel! I bought some coconut and jasmine solid perfumes, which were great to carry with me, and we purchased a cold water portable shower system to use outside of the van. We also made sure to make use of showers as often as we could, booking ourselves into an Airbnb, or visiting friends, once every couple of weeks. Gyms and swimming pools, similarly, have great showers. Feeling clean is hugely important and will, for sure, affect your well-being. But there is no reason whatsoever to not keep clean on the road. Self-care and little luxuries are important, too. A blender for hummus and smoothies, battery-operated fairy lights, a bar of chocolate, some coconut shampoo, or some peanut butter. Each person has an individual selection of things that can make them feel a lot more comfortable, and those few things are some of mine. Figure out some small comfort-items that you really enjoy and appreciate having around you, and bring them with you on your journey. In rough moments, or when you’re feeling a little tired or overwhelmed, these things will prove invaluable. 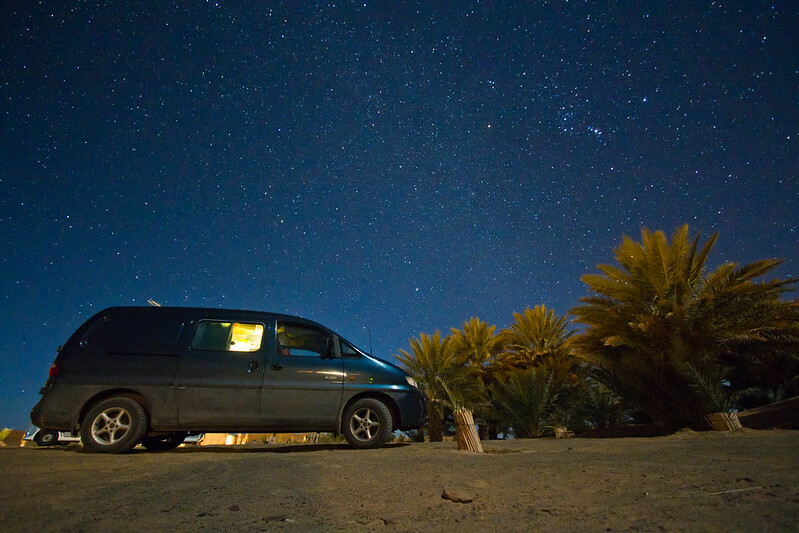 A long-term vandwelling experience with another person, whether a friend or a partner, can be challenging. 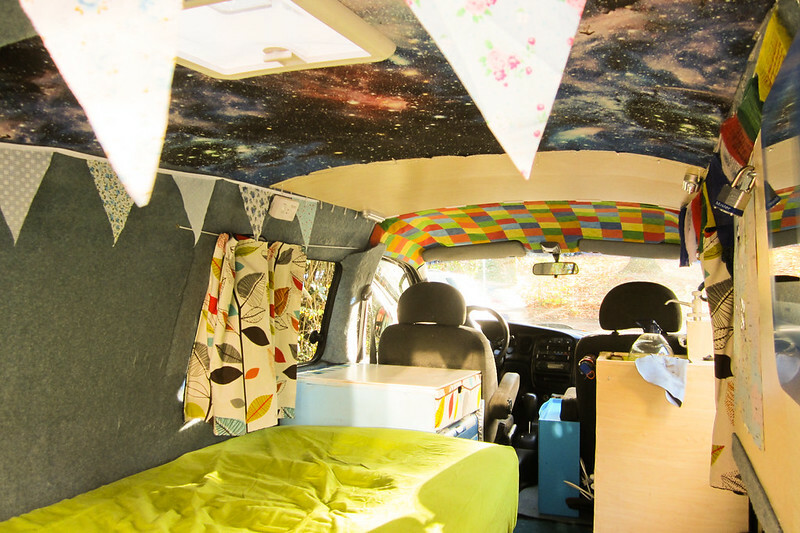 For all of the companionship, joy and laughter – I really believe that vandwelling is hugely preferable when experienced as part of a team – the reality is that you’ll be living in a tiny space with another person. Despite the romance, of which there is a lot, you are going to get on top of each-other!! Once in a while, or quite often, depending on your demeanour, you might feel like you need some alone time. This may or may not be achievable, so figure out how to manage your personal retreats. Books, music, photography, and writing, are some of my suggestions. Listen to podcasts and audiobooks. 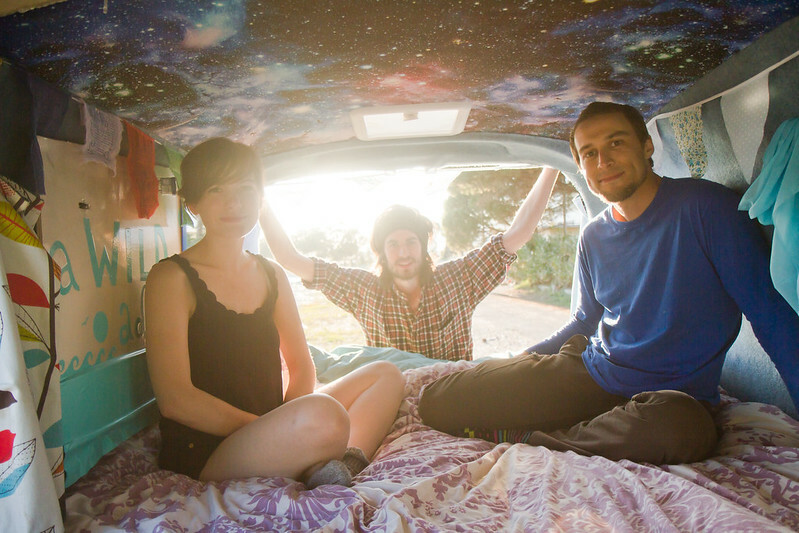 When vandwelling with another person, tiny frustrations might transform into issues magnified tenfold, by confined space and a lack of any sense of privacy. Practice empathy, understanding, and perspective. One of the biggest plus points of living such a life with another person is that the confined space will bring you closer as a couple, or team, and the experiences that you will no doubt have together will challenge, and strengthen, your relationship. You are living the dream, together. You can’t thrive if your environment isn’t safe, if you don’t feel secure in your home. Make sure you have a fire extinguisher that is the right size for your van, and a carbon monoxide alarm is super crucial. Ensure you have a first aid kit and some basic knowledge of first aid techniques. Make sure your most treasured possessions have clever hiding places inside your van, that you can lock, if you aren’t going to be carrying them with you at all times, and make sure to always carry your ID/passport with you. Back up media on two hard drives. Try to learn the local emergency numbers, and have a plan if things were to go wrong. If you’re getting insured, make sure to read the fine-print of your insurance – even the most reputable companies will try to get out of paying, if they can. Things do go wrong, be prepared for anything! So, those are just a few basic tips on how to not just stay comfortable, but thrive, whilst living the vanlife. Any more suggestions or tips? Let us know!! Love seeing van conversions! We drove across Canada to the Yukon and back, in our minivan, with our four year old for seven months last year. Had to hibernate for the winter but we are hitting the road for a few months again before forced to hibernate. You are brave for wintering in the van though! Look forward to reading your future posts! Cheers! Hello, love your van!! This might be a silly question but I am new to all of this. I am converting a chevy astro. I have seen a lot of people install the roof vents but I don’t know how. Did you go buy a special tool to cut through the metal or did you have a professional do it? It always looks like everyone does it themselves. We used a jigsaw. Measure a few times, then just go for it.